Enjoy spectacular 180-degree ocean views from every room of this beautifully remodeled plantation-style home. Extensive use of beautiful Shoji screens and a traditional Furo tub in the master bath highlight this retreat-like home set on three lush acres. A traditional zendo (Buddhist meditation area) adds to the serenity of the atmosphere. Please view the floor plan of the main floor in the photos section! The hillside location and surrounding acreage grant a high degree of privacy and the electric-gated entry assures security. The house is well-stocked with videos and a variety of books including several excellent local guidebooks. Cable television and wireless, high-speed internet access are included for those who don't want to be too disconnected from the 'real world'. 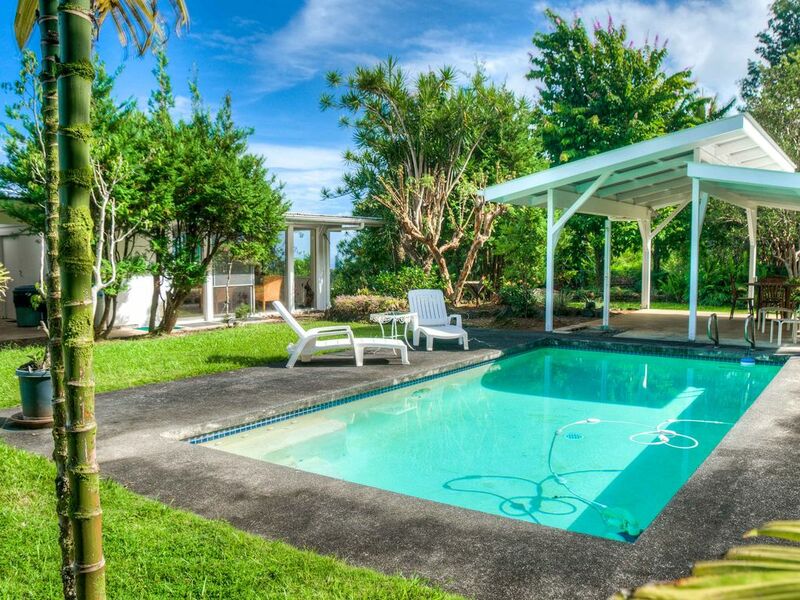 The private backyard swimming pool and covered lanai make this an excellent choice for families. The extremely well-supplied, modern kitchen is a chef's delight. All amenities including seasonings and basic staples are there for your use. You will enjoy breakfasts on the screened lanai caressed by the gentle tradewinds. From the breakfast table you can actually see the plumes of migrating humpback whales just offshore. The Hamakua coast offers unparalleled outdoor activities including nearby Akaka Falls, Hawaii Tropical Botanical Gardens, and beautiful hiking trails. Four-Mile Scenic drive is just a few blocks away, along with beautiful Onomea Bay. We are located minutes from Honoli'i, one of the Big Island's best surfing spots. The area is laced with streams, waterfalls and swimming holes, all against a backdrop of lush tropical vegetation. Located just one mile from the dramatic sea cliffs of Pepeekeo Point, the house is ideally located for exploration of the Big Island. Volcanoes National Park is only 45 minutes away, as is the Waipio Valley to the north. Kailua-Kona is a 90 minute drive. The windward side's best swimming beaches are a short drive. Hilo offers its unique blend of Old-Hawaii charm and modern conveniences, shopping and restaurants. The Farmers Market on Wednesdays and Saturdays should not be missed! A tremendous variety of handicrafts from all over the islands are available at some of the best prices to be found. Local produce in all its wonderful variety abounds. The Lyman Museum and the Tsunami Museum are also well worth a visit. My wife and I live in Inverness California when we are not here in Pepeekeo. We sometimes joke about having to choose between paradise #1 and paradise #2. I am a practicing Emergency Physician and administrator for a large, multi-state Emergency Medicine partnership. My wife, Laura is a Voice Teacher and director of a small local children's theater company in Point Reyes Station, CA. We are both practicing Buddhists and have a dedicated meditation room in the house. My sister is a nurse practitioner who has lived and worked in the Hilo area for 20+ years. We fell in love with the area during multiple visits here and decided to buy a second home. Our vision has been to create a serene, retreat-like space where families and small groups, as well as ourselves, can enjoy the uniquely nurturing environment of this beautiful island. The privacy, quiet, gorgeous ocean views and beautiful gardens of our home make for a wonderful place to simply hang-out and relax. The pool and large yard and covered patio are very popular with families with children. We LIVE here part-time and the house is our home. It is furnished and equipped not like a typical vacation rental, but like a home. Our guests have always appreciated that and been very respectful of our home, which we deeply appreciate. Master bath has a walk in shower stall, toilet, urinal (yes... a bit unusual) and vanity sink. The Master suite ALSO has a separate space with a wooden Japanese euro (soaking tub). This is not a hot tub but a tub you will fill for each use. The second bath is en suite to the second bedroom. It has a tub/shower, toilet and vanity sink. The third bathroom has a tiled walk in shower, sink and toilet. Full size fridge and freezer Note.... our tropical air is such that even frost free refrigerators become icebound. Because of this our ice maker is unreliable. Please purchase bagged ice. Kitchen is central to the living areas and is the heartbeat of this house. Cooks love this kitchen for it's accessibility and size and it's proximity to dining room table, lanai table & living room. Pool is modest in size... about 8 feet deep at deep end, about 3 feet at shallow end. There is a large shelter next to the pool for dining, lounging. Charcoal grill. NOT A STANDARD HOT TUB! This is a Japanese furo. Meant for soaking in, this is a common household amenity in Japan. Shower off before entering, then take a hot soak in the wooden tub called a furo. Private gated entrance to property. House is entirely fenced. Very private back yard with pool and a poolside shelter or cabana, with an outdoor poolside shower. Please note the 'hot tub' is not standard 'american' style hot tub. It is a Japanese wooden furo. Meant for hot soaking in after first showering off, this is a common amenity in Japan. This wooden tub, called a furo, is in the master suite. Excellent location and a beautiful property. We would definitely stay again. We spent 4 nights here on the tail end of our big island trip. The difference between this side of the island vs Kona is crazy. Felt like we were in Jurassic park driving around in the two seater jeep with the top down. Excellent food options in Hilo combined with a ton of day trip opportunities meant that we spent most of our time away from the house. That said, the house is huge. The highlights were the pool and the screen room. We spent most of our time in those two places. Made friends with a gecko on the deck who we happily named Frank. He kept us company most mornings. Besides a few bugs here and there we mostly only saw geckos. The place was everything we asked for and fit our needs perfectly. I would happily recommend this place to anyone. Buyer beware moment, it gets loud at night. As with most places we came across on the big island it isn't very sound proof. If you've ever stayed outdoors in a tropical rainforest then you probably already know what I mean. Bugs/birds/dogs/rain/wind all made an impact and made for some nice ambiance. I can see how some people who are used to peace and quiet might have trouble with this so keep that in mind. The hosts were great and I always felt like they were available if we had any issues (which we didn't). We thoroughly enjoyed our stay! The pool was a bonus! Our family of five really enjoyed staying at this property. The kids loved playing in the pool and we appreciated how well kept the property is. A memory to remember, a view of the ocean out front and the jungle literally just beyond the back yard. Add'l guests over two are charged $15/person/night over base rate (depending on rate schedule which changes during high seasons). Cleaning Fees increase by $15 with add'l guests over 2. A damage deposit of $300 (refundable if the house is undamaged and left tidy)is paid with the final payment Fee payment may be divided into three payments if the total quoted amount is over $650. Occasionally we will accept three night stays if it fits our vacancy/occupancy calendar.